I'm not sure why I'm posting these cause they're old as dirt, but they're my first gouache paintings so I feel the need to put them up. This assignment was to take a nursery rhyme an put it in a different setting. I took Jack Sprat and his wife and put them in a McDonalds. 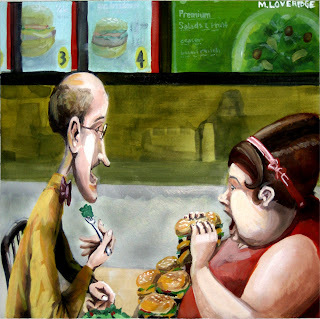 I really didn't want to ask anyone to model for the wife for obvious reasons, but luckily when I took my girls out for lunch to discreetly get some fast food reference, there was a group of rather large women eating lunch together. I got my daughter to pose for me then I focused past her and took a picture of one of the lady's taking a bite. I was quite proud of myself at the time, but in telling the story I feel a little shame. I'm sure I'll get over it. 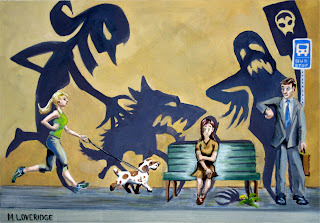 This painting was on an article about people who are afraid of everything. I Think I could work on the quality of paint but I was really happy with how the concept turned out.